I am so excited to share with you all this new segment! My friend, Crystal, has asked me to help her plan some aspects of her wedding. I met Crystal through my best friend/Maid of Honor, and I offered my assistance to her if she ever needed any. Well as it turns out, she has asked me to help create her wedding invitations! So now I am on a new mission for a new wedding for a new bride and I couldn't be anymore thrilled to help her. I hope I will have more details of their wedding to share with you all. So far, here is what I have.. Crystal and her fiance, Brian, are planning a wedding for June 18, 2011 in my hometown. Their color scheme is going to be yellow and gray. 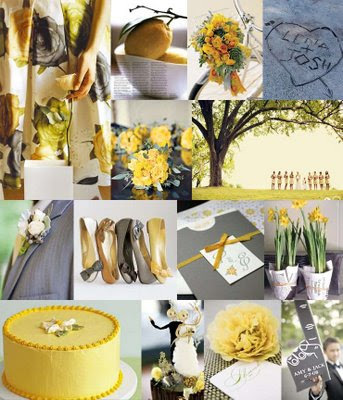 I've noticed that yellow and gray is becoming a more popular scheme for weddings. Isn't it gorgeous? So much in fact, I have asked my husband how he feels about it and now, we plan to use the same color scheme for our living room! But anyways, back to weddings. The day after Crystal enlisted my help on the design of her invitations, I immediately got to work. She had sent me an idea of a design that she liked from Merriment Design. The invitations are made of mostly fabric and since I'm not yet knowledgeable about the craft of sewing, I asked her if she would be against the idea of using cardstock to make a similar design for her invitations. Once I was given the go ahead, I went straight to work with supplies that I had on hand. So here is a mock up of what I came up with..
Now, keep in mind that this is rough mock up of a potential invitation for her, and the colors may end up darkening or lightening in terms of shade, but for the most part, I say that the mock up came out really well! It involves quite a bit of cutting of the individual shapes since they were all cut freehand, but the design definitely allows for variation. I suggested that we could make some invites like these and then for others, we could change the dominant color of the flower from yellow to gray and use a yellow button instead, or we could make a white flower. So many ideas are already flowing through my head, and I can't wait to finalize all the details with her! I love you Lacey!!! I can't wait to see your living room!